TOKYO (Reuters) - Japanese Economy Minister Akira Amari said on Monday that the government should deploy fresh fiscal stimulus to prop up the economy if third-quarter preliminary gross domestic data due on Nov. 17 turns out weak, public broadcaster NHK reported. 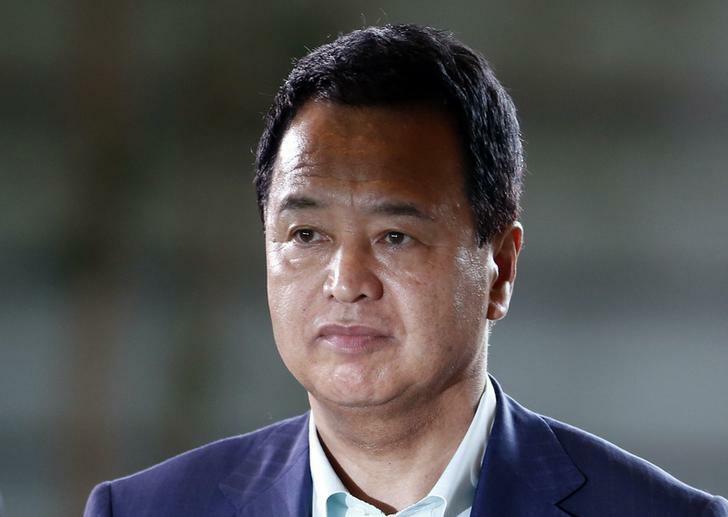 Amari also said the stimulus steps should be taken regardless of Prime Minister Shinzo Abe's decision by year-end on whether to proceed with a second sales tax increase planned for next year aimed at reining in massive public debt. The comments came days after a shock move by the Bank of Japan to expand its massive monetary stimulus raised speculation that Abe would go ahead with the next tax hike in October, if it were followed by promises of added fiscal steps to offset a tax pain. Amari said additional fiscal stimulus should be aimed at stimulating private consumption, particularly low-income groups and families with children, hit hard by April's tax hike to 8 percent from 5 percent. The government plans to raise the levy to 10 percent in October next year. But April's tax hike triggered the deepest economic slump since the 2009 global financial crisis, when the economy contracted an annualised 7.1 percent in the second quarter, and a weak recovery in the following quarter cast doubt about the next tax hike. Amari, speaking at a seminar, noted some private-sector economic forecasts for July-September are said to be short of an annualised 2 percent, compared with an initial projection of above 4 percent growth, according to NHK. Analysts polled by Reuters expect an annualised 2.9 percent bounce in July-September. "If figures turn out to be bad, (government) support would be needed. Consumption has fallen a lot among low-income groups and child-rearing generations, and it would likely be that steps should be taken by pinpointing" the target, Amari said. Speaking to reporters after the seminar, Amari added: "It should not be mistaken that "support" (for the economy) means support for the sales tax hike. I think the prime minister will think of the two as separate matters." Abe is expected to make a final decision on the tax hike after revised July-September GDP data is published on Dec. 8.